Coffee Forests in India are unique not just because they are positioned in one of the 10 hot spots in the Western Ghats, but earn a place of ecological significance for the incredible wealth of biodiversity they possess in terms of flora and fauna. The Coffee forests teem with both macro and micro wildlife, microorganisms, herbs, shrubs and tree diversity, with a high degree of endemism some species, which are not present in any part of the Planet. The multi layered tree canopy provides the ambient temperature, shade and energy balance in terms of symbiosis and other mutually beneficial interactions. The Western Ghats also recognized as a mega biodiversity hot spot is has recorded 269 species of snails, 75 % of which are endemic to the region. Species diversity and endemism of land snails of the Western Ghats. To date, 1,488 species belonging to 26 families and 140 genera have been recorded from India. Of these, 270 species of land snails have been recorded from the Western Ghats area and constitute about 18 per cent of the country’s total land snail fauna. The land snail fauna of the Western Ghats includes members of 24 families and 57 genera. Land snails constitute about six per cent of the total species on Earth. Al these years we were busy mapping the biodiversity of coffee forests in terms of Mammals & bird life. It is a fact that smaller and lesser known species, especially the invertebrate species have not got their due, even though they exist in far greater numbers. We got interested in snails & slugs because scientific literature points out that they are potential and reliable indicators of the health of the ecosystem they inhabit. Another interesting observation we found was that some of the snails which are endemic to the Coffee Forests are found nowhere else on the Planet. Depending on the topography of the Coffee forest, many species have very restricted ranges within the region. There is a decline in diversity and local endemism during the summer months. 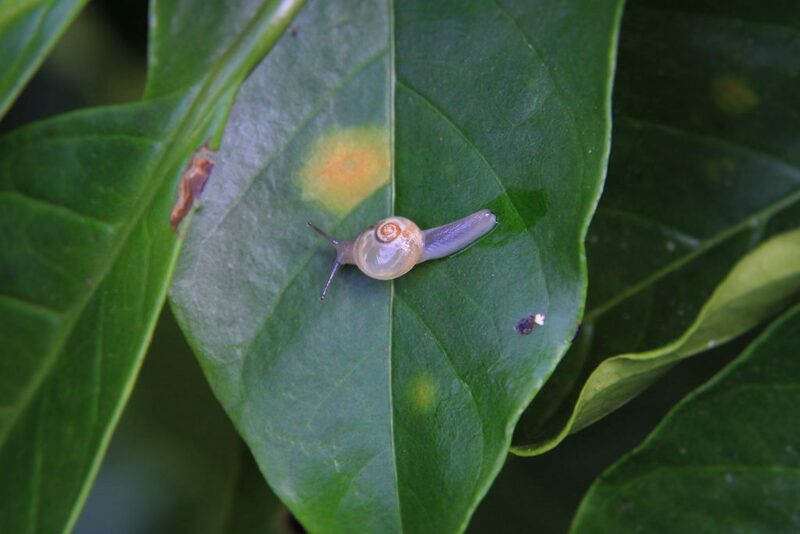 Understanding the diversity, endemism and distribution of land snails inside Coffee Forests will be an ideal way to develop bio indicator tools to monitor the health of the Coffee ecosystem. The last registry on land snails was done a century ago by the British. It was called “Fauna of British India”. The Fauna of British India had recorded 240 species and few of them are extinct in the present day. This may be due to the fact that the Western Ghats has undergone significant man made transformations due to various factors like timber logging, sand and ore mining, building of dams, rail roads and interlinking of water ways. Habitat destruction and fragmentation may be the single most important factor for loss of species and extinction of a few others. Slug, or land slug, is a common name for any apparently shell-less terrestrial gastropod mollusk. 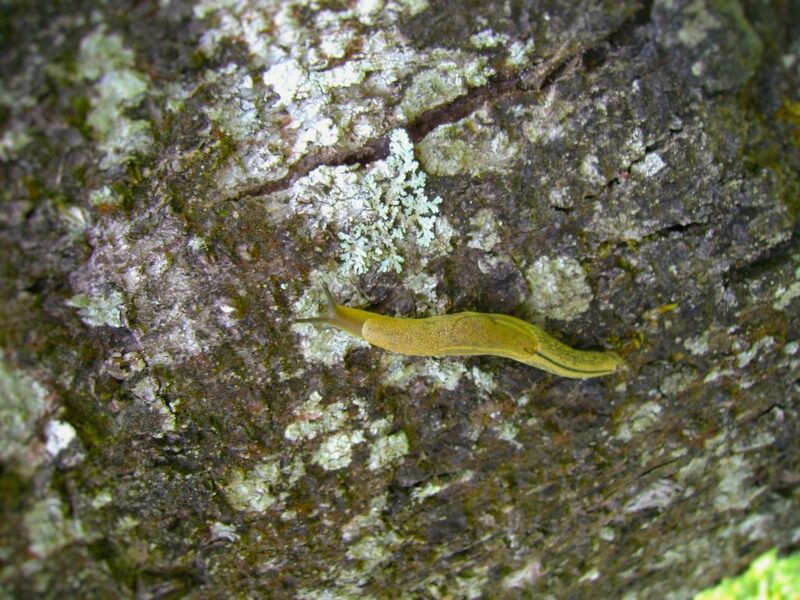 The word slug is also often used as part of the common name of any gastropod mollusk that has no shell, a very reduced shell, or only a small internal shell, particularly sea slugs and semi slugs (this is in contrast to the common name snail, which applies to gastropods that have a coiled shell large enough that the animal can fully retract its soft parts into the shell). Snails and slugs can be found in a very wide range of environments, including wetlands, aquatic habitats, streams, ponds, rivers, coffee shrubs, and the tree canopy. Although land snails may be more familiar to laymen, marine snails constitute the majority of snail species, and have much greater diversity and a greater biomass. Numerous kinds of snail can also be found in fresh water. 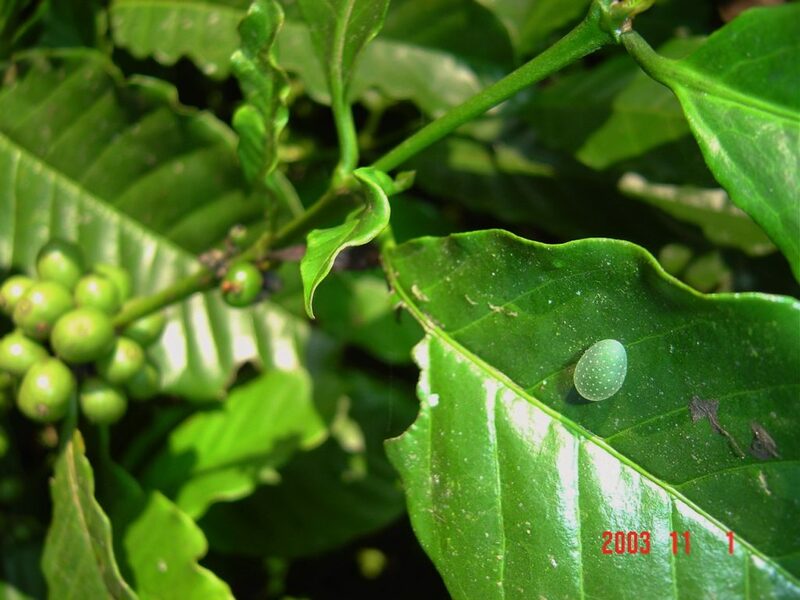 Land snails and slugs form an important component in the coffee forest ecosystem because they provide a number of ecosystem services that are beneficial to the coffee ecology. They are important in the food chain and are vital agents in recycling of nutrients. Many snails are herbivorous, eating plants or algae from surfaces, though a few land species and many marine species are omnivores or predatory carnivores. 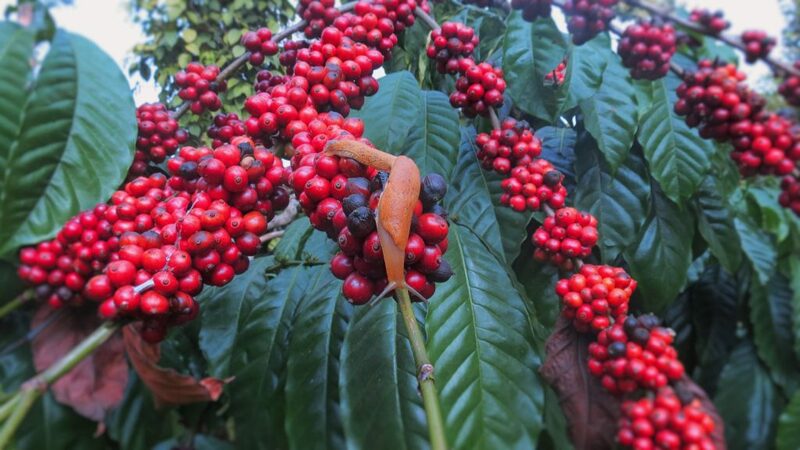 Inside the coffee ecosystem they are also preyed upon by birds and reptiles. Snails also act as important bio monitoring agents. Another important aspect about snails or slugs is that, these small animals require calcium and other nutrients for growth and reproduction. These snails are in turn consumed by a wide variety of predators that also rely on snails for their calcium and other nutrients. 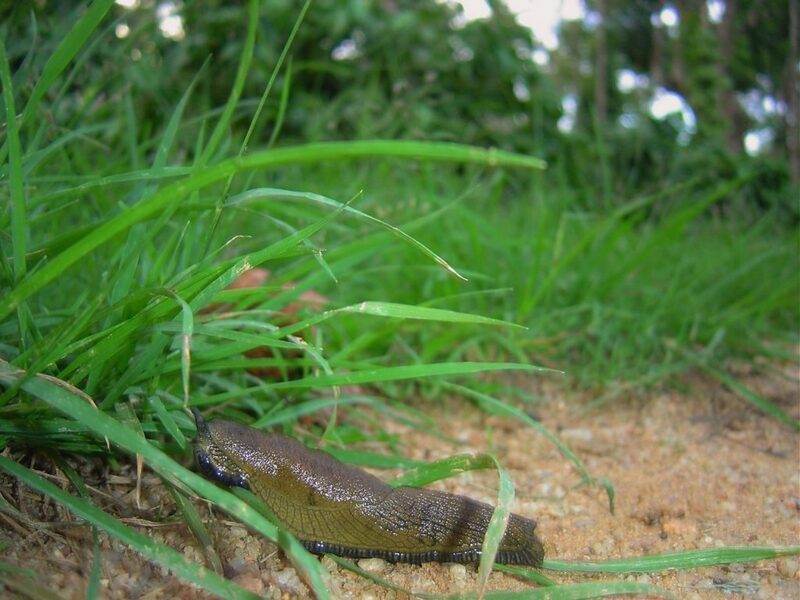 Because some species of slugs are considered agricultural pests, we need to understand their feeding behavior. A small number of species are serious pests of agriculture and horticulture crops. They are capable of destroying foliage faster than plants can grow causing serious economic damage. 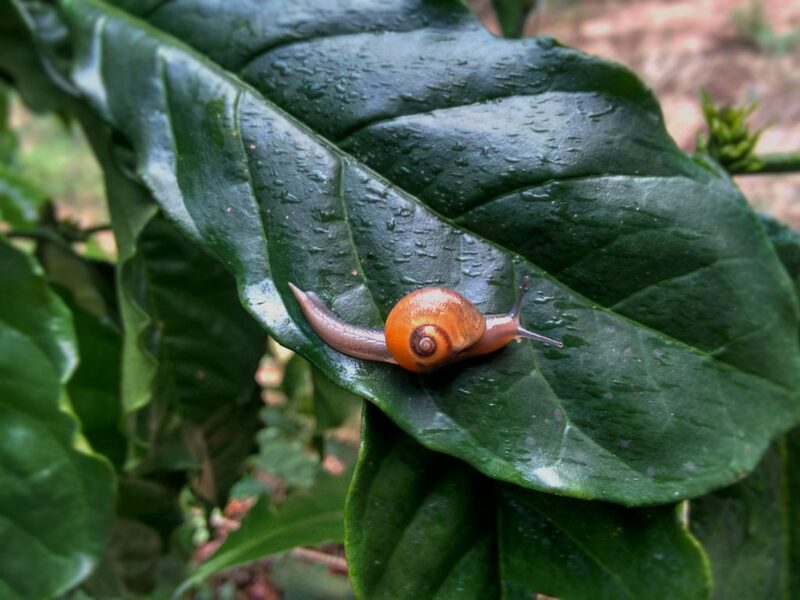 A few years back (2015, 2016) many Coffee Planters were alarmed when a particular snail species started eating the Arabica Coffee Leaves during the monsoon season. In fact there was a population explosion of snails restricted to a small agro climatic region and the damage to Coffee plants was restricted. 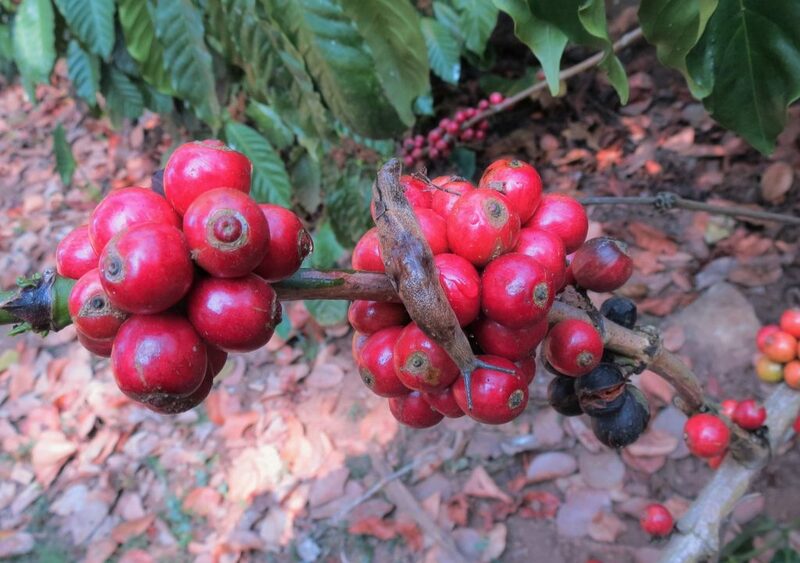 Significant damage was observed in Arabica and to a lesser extent in Robusta. We also need to understand the behavior of snails and slugs. In certain cases introduced snails from abroad are causing havoc in terms of rapid multiplication. We are not certain, regarding the number of species of indigenous snails that act as pests of coffee and other multiple crops grown along with Coffee. Scientific reports indicate that some snails are pests in many horticultural crops causing widespread economic damage. Understanding their behaviour will enable timely remedial action. Snails and slugs feed on a wide variety of organic materials. 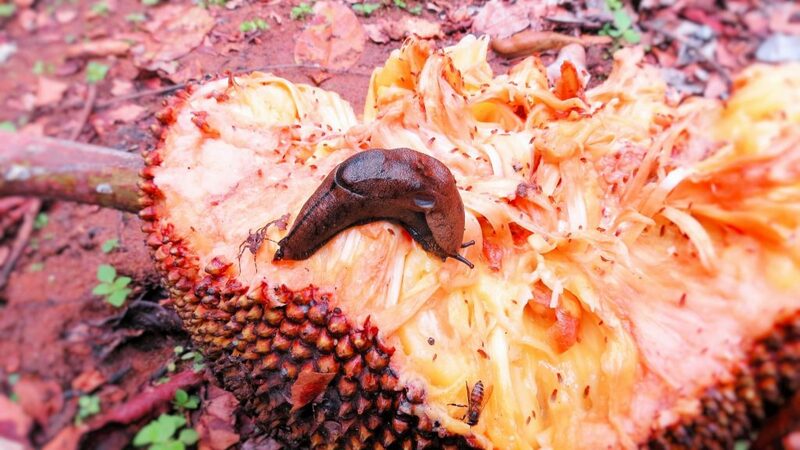 Inside shade coffee, it is pretty common to observe the abundance of slugs, especially during the monsoon period in compost pits or areas where mushrooms emerge. Scientific reports indicate that they also feed on lichens, mushrooms, and even carrion. Some slugs are predators and eat other slugs and snails, or earthworms. We have noticed that the distribution and abundance of terrestrial molluscs are affected by environmental factors. We have observed a surge in population of a certain species of snails during the early monsoon period and a resurgence of some other species during the early onset of monsoon. The distribution and habitat is significantly affected not only by global warming but also due to habitat destruction in terms of timber logging and converting certain landscapes to sun loving cash crops like ginger, oil palm and other crops. The Coffee forests are undergoing rapid transformation and this may lead to the disappearance of many species because of their high sensitivity to changes to impact of climate change. There may be many diverse reasons for the erratic distribution of various species of snails and slugs. We assume that a combination of biotic (Photosynthetic Organisms (i.e. Primary producers), Herbivores, Carnivores, Omnivores) and abiotic factors (Abiotic factors are the non-living components of a habitat. The abiotic factors in an ecosystem are grouped into soil (edaphic), air, topography, meteorology, availability of water and quality of water. The meteorological factors are temperature, wind, sun, humidity and precipitation.) may influence the occurrence, distribution and population trends of snails. 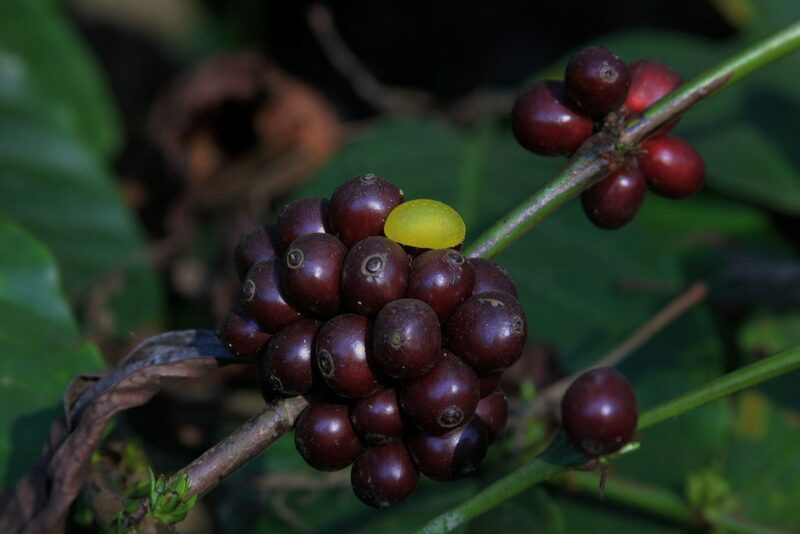 However, in our opinion the single most defining factor is due to the fact that the Coffee forests with their varied topography and wide diversity of habitats along with wet and dry conditions, greatly influence the snail diversity. Soil profile and nutrient status, especially calcium content plays an important role in snail population. Calcium is a prerequisite because it is a major factor for their survival as it is required for their shell formation. Several studies have shown that Calcium is positively correlated with species richness and density. In recent times, due to shortage of manpower, it is common practice among the coffee community to use high powered sprayers to control weeds, pests and diseases using herbicides, weedicides and pesticides. The impact of these chemicals on the local flora and fauna including endemic land snails as well as other invertebrates is unknown. It is important to understand the impact of various package of practices of coffee on land snails and slugs because snails are sensitive to every single minute changes in the coffee ecosystem. We noticed some species easily adapt to high temperature stress and prolonged drought like conditions, where as other species can easily adapt to very heavy rainfall conditions. Dr.Madhyastha,a leading expert in this field is of the opinion that these small animals need to be brought under a regular biodiversity protection programme. “The largest number of extinction has been in mollusks and slugs as they were slow moving which made their habitat smaller and any sudden imbalance or alteration in the habitat will destroy their existence,”. 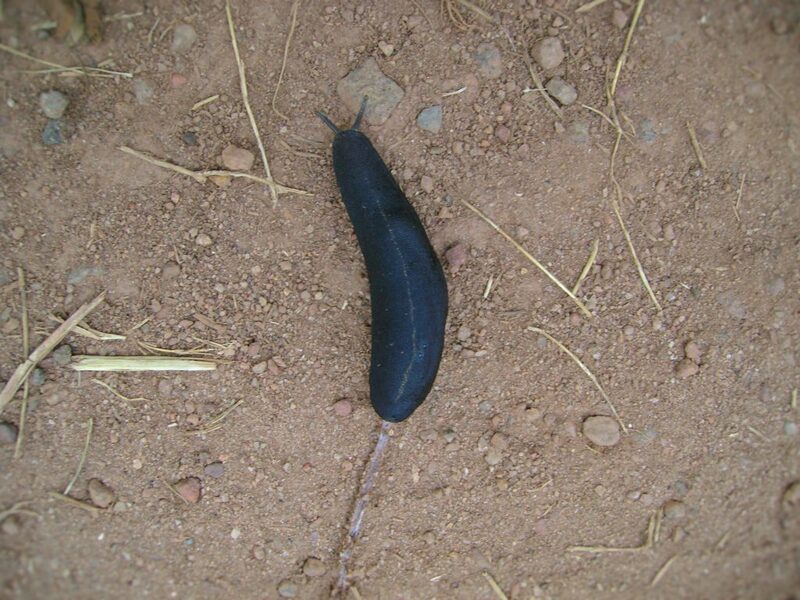 To date very little information is available on the distribution status and threats of land snails and slugs in India. 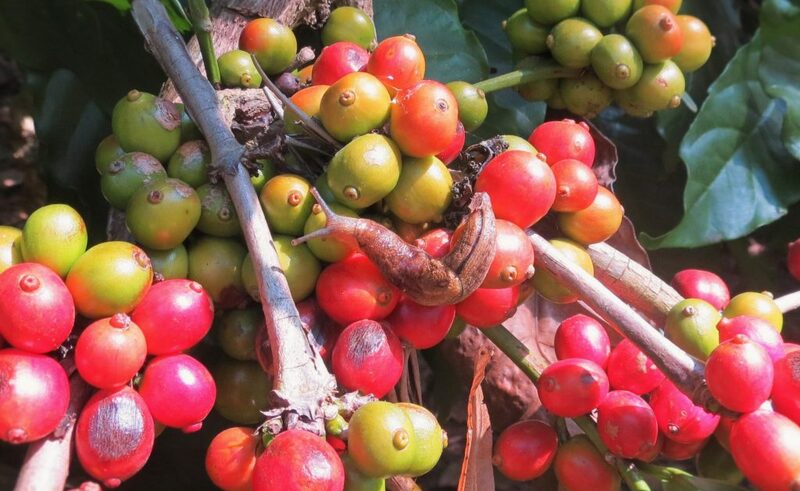 Ecologists are yet to understand the ecological significance of Snails inside Coffee Forests. An in-depth study in terms of species distribution, population and other aspects will throw light on the exact symbiotic or antagonistic role they play in the coffee ecosystem. We also need to prepare a blue print in terms of biological control instead of chemical control so as to target species specific target organisms, there by safeguarding the fauna of the entire ecosystem.